Three vehicles were involved in an accident on Bankhead Street in downtown New Albany. 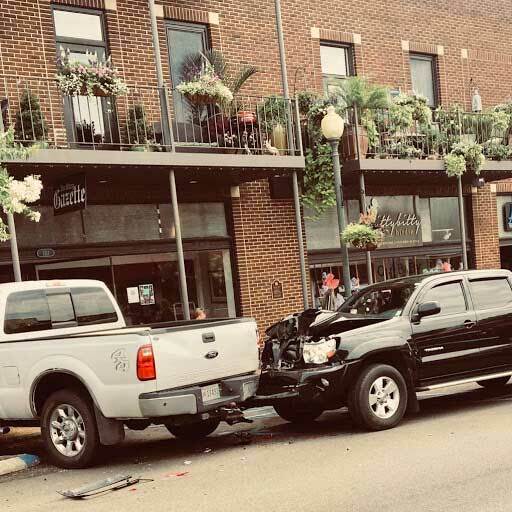 The driver of a large pickup truck struck a parked pickup and a minivan on downtown New Albany’s Bankhead St. Friday afternoon, damaging all three vehicles. This pickup truck and one other vehicle were struck while parked in downtown New Albany. Eyewitnesses said the pickup was traveling east at a brisk speed when it veered into the parking area on the south side of the street, in front the Hamilton Building. It is believed nobody was in the two parked vehicles. Public safety officers on the scene said they did not believe the woman driving the pickup was injured. The Bankhead Street accident occurred between 4:00 and 5:00 p.m.